Designers – POLs have arrived. Wishing you the best of luck this week in your presentations! Practice and preparation will get you far. 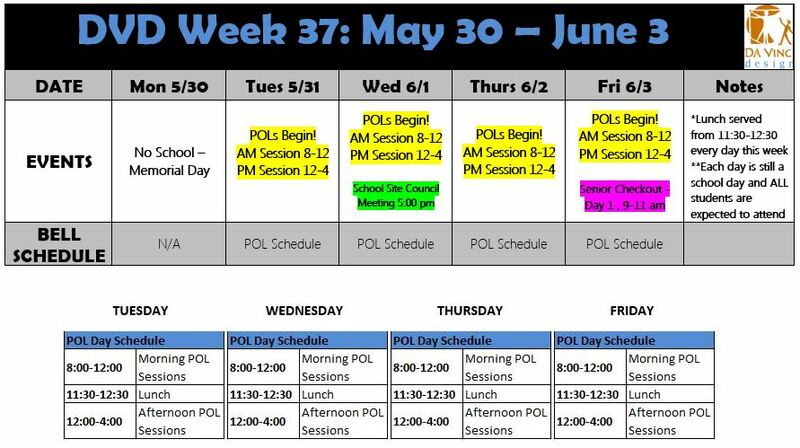 As a reminder, POL days are still school days and we expect that all students attend their respective sessions every day. Attendance matters! If you have any questions about POL schedules, please contact the school. Parents – we would love to see you at POLs if you are able to attend. Enjoy your 3 day weekend and we will see you on Tuesday! School Site Council Meeting (last of this year) is on Wednesday 6/1 at 5:00 pm in Room 103. Senior Checkout begins on Friday 6/3. It is available from 9:00-11:00 am Day 2 is on Monday 6/6 during the same time frame. Students must complete their senior check out form, the Naviance senior survey, and have no remaining balances in order to pick up their cap, gown and tickets on those days. Congratulations to the cast and crew of our Spring Musical, You’re a Good Man, Charlie Brown on two amazing performances this week! It was a phenomenal show! We also want to thank all of our current Da Vinci students, staff and families who attended the incoming student BBQ yesterday. Our incoming families love to hear from you and meet you! 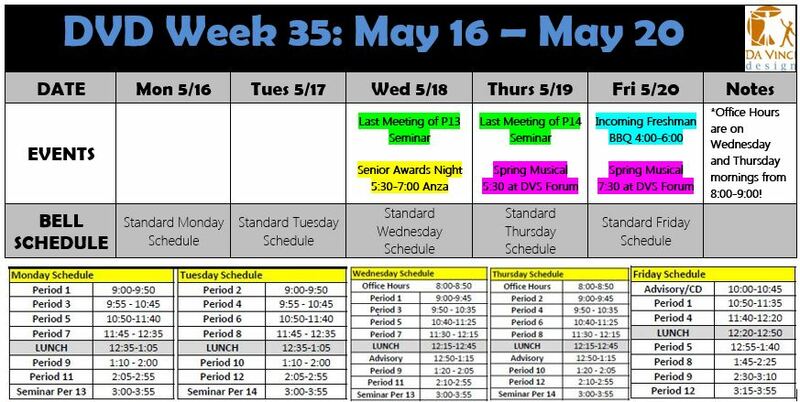 Designers – can you believe we have less than 3 weeks of school left? POL prep week has arrived. Remember to use your time effectively this week: ask questions, get feedback from teachers and peers, and use prep time wisely! No advisory or CD this week. Reminder that Monday 5/30 is Memorial Day and there will be no school. 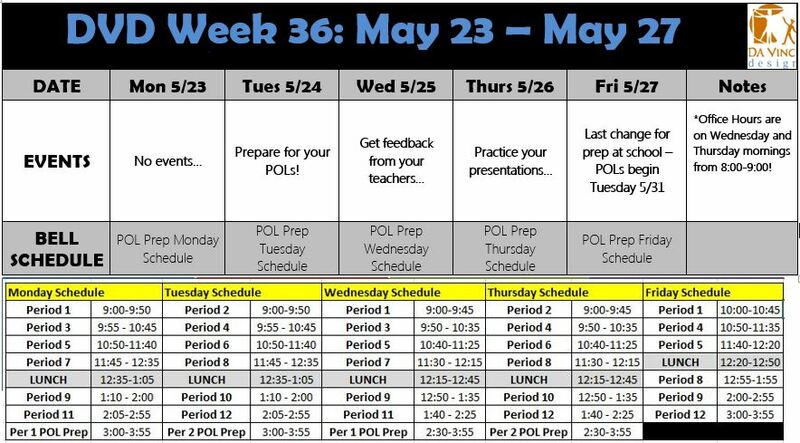 POLs begin on Tuesday 5/31. Enjoy the rest of your weekend and we will see you Monday. Attention Junior Families! Posse Foundation Application deadline extended! The deadline to apply to the Posse Foundation had been extended until Monday May 23rd! Don’t know what the Posse Foundation is? Its a wonderful organization that identifies and trains young leaders from urban areas in LA and sends them in multicultural and diverse teams of 10, or in a “Posse”, to top colleges and universities across the US. Posse Scholars receive a full tuition ride scholarship. For more info, please see the attached flyer. The application is attached below, as well. Turn completed applications into Erin Knott. As always, if you have any questions at all about the Posse Foundation Program, see your counselor! Senior Awards Night is tonight! Seniors, if you received an invitation, we look forward to seeing you and your families there! Light refreshments will be served. The Ryman Arts Program has extended the application deadline to May 31, 2016. Details are attached below. This free arts program is available to students in Grades 8-11 and meets on Saturdays at either Cal State Fullerton or on Sundays at the Otis College of Art and Design. The application submission requires an application, teacher recommendation, essay and 2 pieces of artwork. 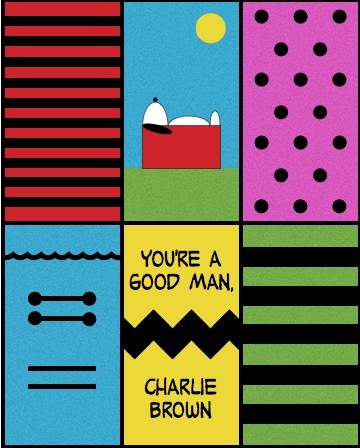 “You’re a Good Man, Charlie Brown” – Performances this week! Thanks to Charles Schultz, everyone knows and loves the timeless PEANUTS crew. Come see Charlie Brown, Snoopy, and the gang sing, dance, and perform in Da Vinci’s spring musical “You’re a Good Man, Charlie Brown”! There will be 2 performances: Thursday at 5:30 PM and Friday at 7:30 PM. Both will be at the Forum at Da Vinci Science (13500 Aviation Blvd.). Tickets are on pre-sale for $5 and at-the-door for $8. Designers – there is a lot happening in Week 35! We have the spring musical, senior awards night, the incoming freshman BBQ and the last meetings of seminars. We’ll see you there – you won’t want to miss any of these events! Seniors, if you received an invitation, we’ll see you there! Light refreshments will be served. All current students are invited to come welcome our newest DVD family members! *Food will be served – no cost! Student Parking Issue has been resolved. Students may park in the Del Aire Park lot again beginning Monday 5/16. Students, please play music at a reasonable level, do not leave trash and overall, please be respectful of the space. Thank you! Designers – it has come to our attention that the park is no longer allowing students and staff to park in its spots. We are working to correct this issue, but in the meantime, please park in our lot or the surrounding neighborhood streets. We ask that you are respectful of our neighbors, obey all parking signs, and for all drivers, whether parents or students, please watch your speed. There have been many reports of high speed traffic through the neighborhood and we want to ensure safe arrival to and departure from school for our students. Students – are you looking for a way to get service hours by the end of the semester? 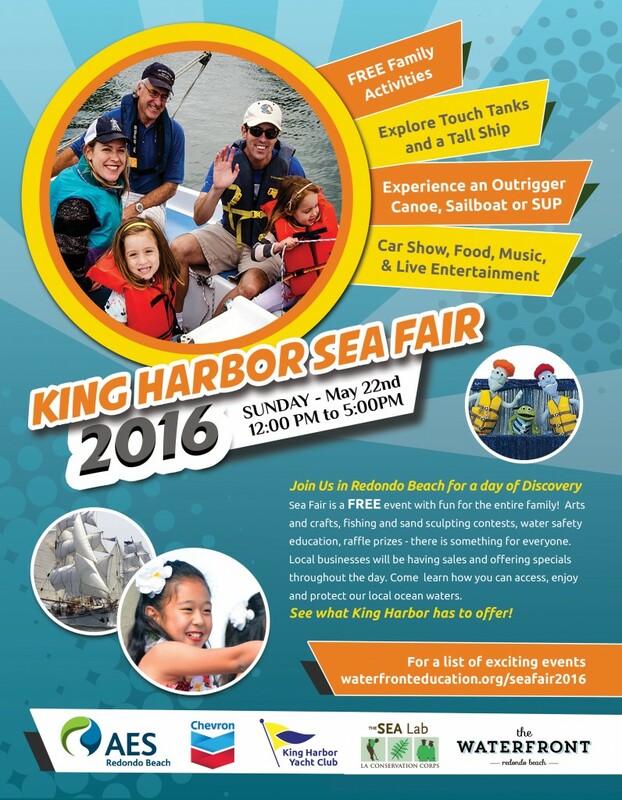 Sign up to volunteer at the King Harbor Sea Fair in Redondo Beach on Sunday, May 22nd from 12pm-5pm. Running the Sand Sculpture Contest – Do you and your friends or your school club want to actually run the Sand Sculpture Contest? Your roles would include signing the kids in, telling them the rules, judging the sculptures, etc. If you are interested in this, please contact Brittney Olaes at bmolaes@gmail.com.